added support NUVOTON NPCE288NA0DX TQFP128 via an adapter! cartoons NUVOTON 288,388 NPCE288NA0DX NPCE288 NPCE388 in TQFP128 body supported if purchase an adapter . check all keyboards offline and in the shell program. Switching signal for the controller firmware is not automatic, it is necessary to collect 5 jumpers "clearing". Jumpers are included. The procedure is simple and is described in the instructions. Firmware EEPROM arrays (EDID) takes place with the help of lace, which is attached. With EDID lace can be sewn matrix notebooks with connectors 30 and 40 pin. With EDP matrices and tablet matrices does not work! To verify the keyboard in standalone mode, you only need to supply power via USB and install jumper. Pressing any button will be accompanied by an audible signal. This test is very useful when checking drenched keyboards. Staffing is only one connector to 32 pins with a pitch of 1 mm. 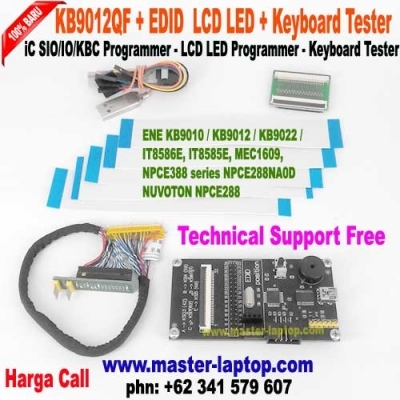 To verify the keyboard in steps of 05mm and 08mm You need to find yourself and install the necessary riser card connectors.